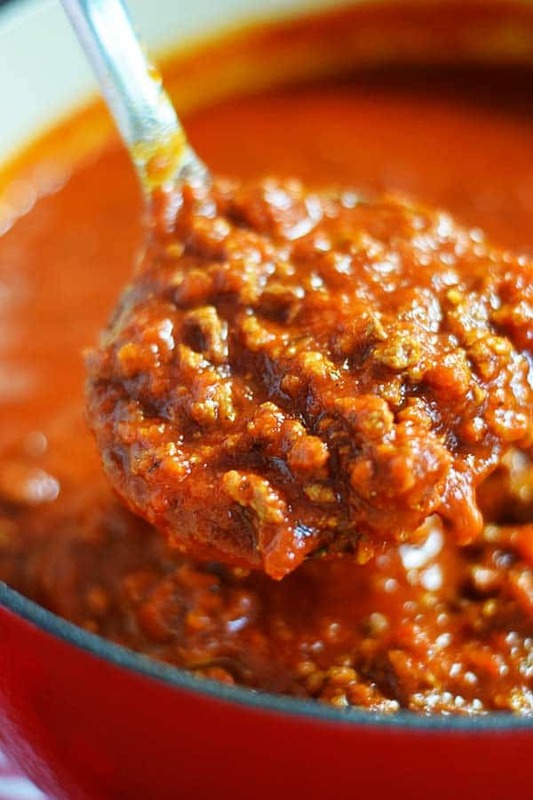 Take jars of marinara sauce and fancy them up a bit with tons of flavor! 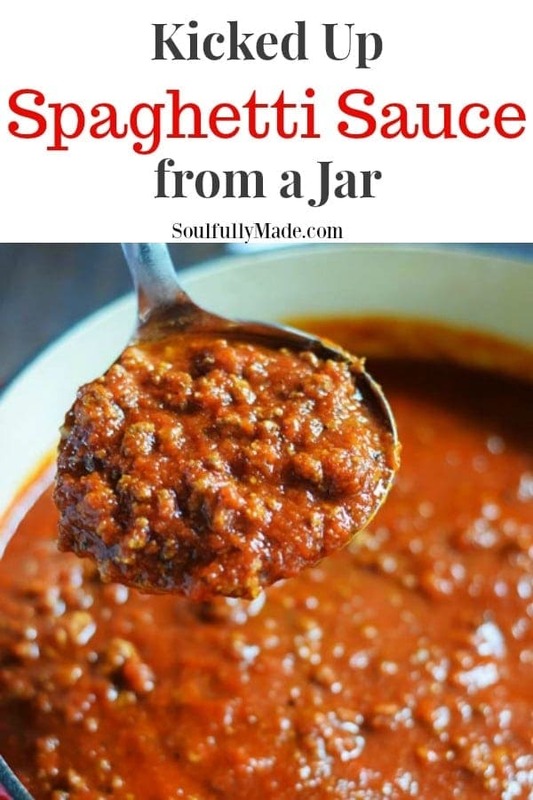 By adding in a few simple ingredients you get Kicked Up Spaghetti Sauce Out of Jar that is rich, hearty, and absolutely delicious! 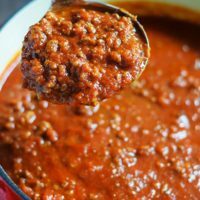 Who loves a great sauce? 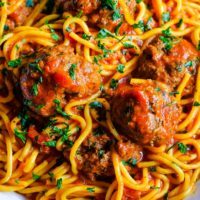 Well this one really kicks up the flavors of typical jarred spaghetti sauce. 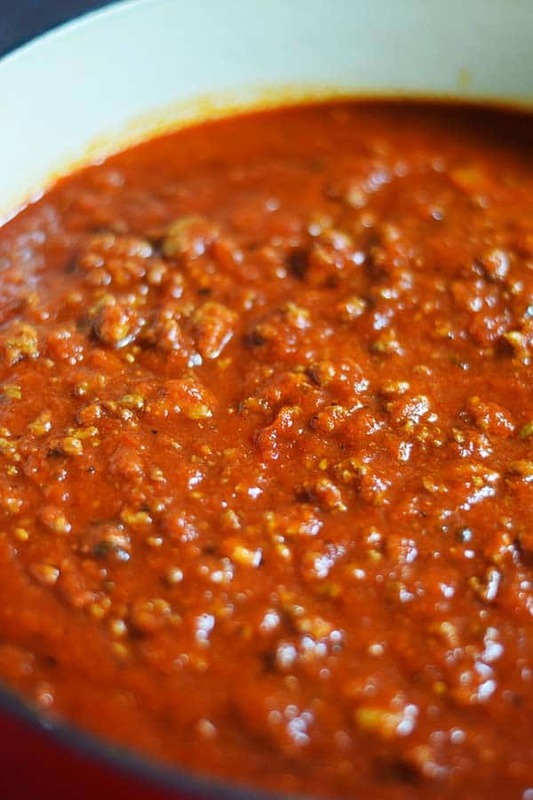 I have made a many a meals with just some jarred sauce and ground beef, but this sauce just makes my mouth water. 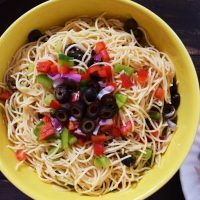 It always gets rave reviews from my family and the guests I feed this one to! Typically, I start this in the crock pot before I head out to work or to start my day. That slow cooker lets these ingredients work their magic and I come home and sneak a dip with a nice chunk of bread! Put on my pot of noodles or put together Homemade Lasagna or Easy Baked Stuffed Shells. When the family get a whiff of this cooking they bug me until it’s on the table. 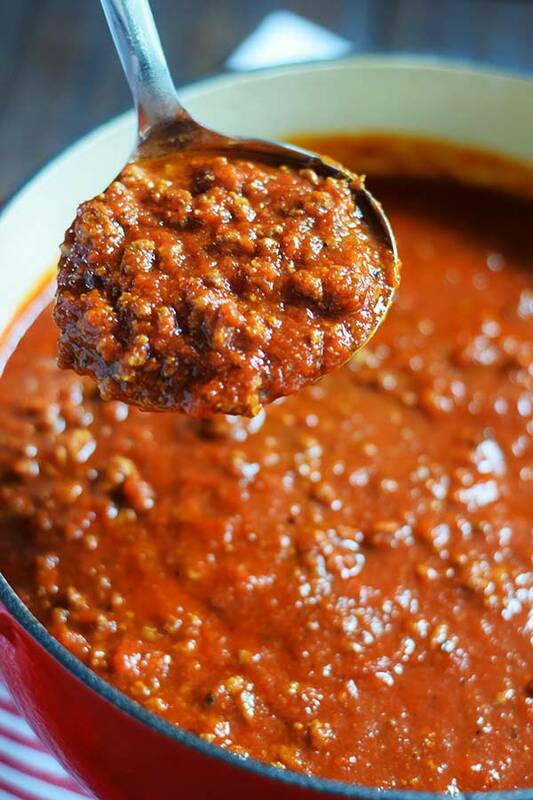 I have a little secret ingredient (or two) that does something wonderful to this meat sauce. What gives this Kicked Up Spaghetti Sauce from a Jar it’s Kick?? 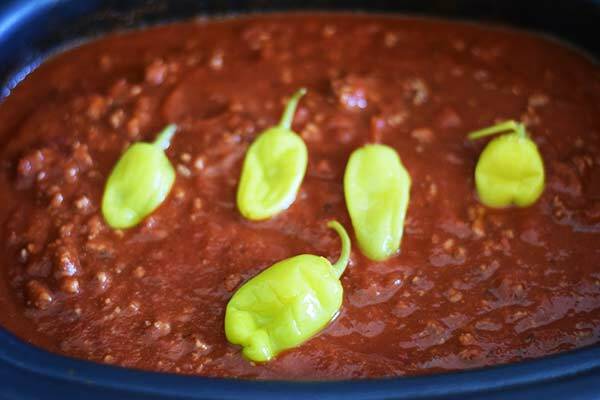 In a multi cooker on high (or skillet or pot if cooking on stove top – over medium high heat), sprinkle on garlic salt or salt and pepper to taste. Crumble ground beef and Italian sausage and cook until no longer pink. Drain fat from meat. Return to slow cooker or pot. Add in jarred sauces, pizza sauce (secret ingredient alert), garlic, red wine, sugar and stir. Add salt & pepper (or red pepper flakes, if desired) to taste. Cover with lid and cook in slow cooker for 8 hours on low or 4 to 5 hours on high. Now this makes a whole lot of sauce. I typically use this to make several layers of delicious Homemade Lasagna, Or Stuffed Shells, or we use it for spaghetti, baked ziti, or any pasta you like. To me the sauce is even better the next day if that is possible ;)! AND It freezes well. Once cooled, place leftovers in a ziplock freezer bag or air tight container and freeze for up to 6 months, until ready to use. ake jars of marinara sauce and fancy them up a bit with tons of flavor! 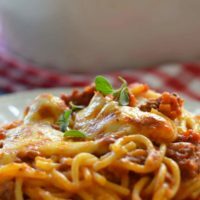 By adding in a few simple ingredients you get Kicked Up Spaghetti Sauce Out of Jar that is rich, hearty, and absolutely delicious! In a multi cooker on high (or skillet or pot if cooking on stove top - over medium high heat), sprinkle on garlic salt or salt and pepper to taste. 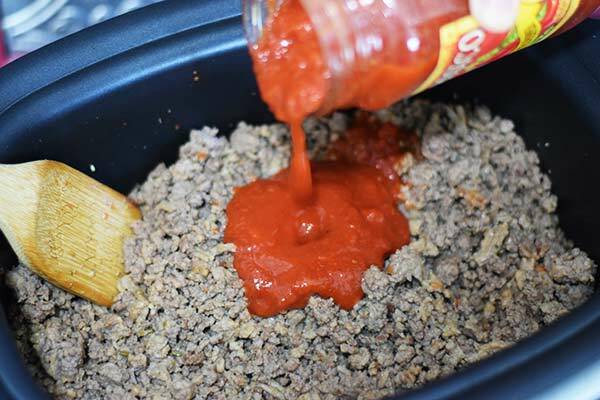 Crumble ground beef and Italian sausage and cook until no longer pink. Drain fat from meat. Return to slow cooker or pot. Add in jarred sauces, garlic, red wine, sugar and stir. Add salt & pepper (or red pepper flakes, if desired) to taste. Top with 4 to 5 pepperonchinis. If cooking on stovetop, Bring to a boil. Reduce heat to medium low and cook until warm. I like to cook at least 1 hour to develop flavor. You can also find this at Weekend Potluck! This sounds amazing. Perfect for our Sunday get together. I think I will make the sauce Saturday so it can have time to mingle mingle. 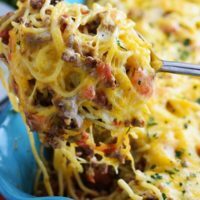 Love your blog and so many great recipes. Thanks for sharing.